Connects any CAT5e or CAT6 application such as computer to hub, patch panel or wall jack. 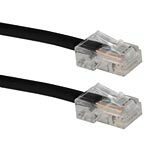 This CAT6 UTP PVC solid patch cord supports all CAT5e & CAT6 high speed applications such as GigEthernet. This RJ45 cable supports IEEE 802.3af & 802.3at POE standard and uses thick 23AWG pure copper solid conductors to support power delivery to POE devices including wireless access points, regular and network security cameras or IP phones.